The researchers, at Washington University School of Medicine in St. Louis and the University of Illinois at Urbana-Champaign, developed tiny devices, containing light emitting diodes (LEDs) the size of individual neurons. The devices activate brain cells with light. The scientists report their findings April 12 in the journal Science. This implantable LED light can activate brain cells to release dopamine and is smaller than the eye of a needle. For the study, Washington University neuroscientists teamed with engineers at the University of Illinois to design microscale (LED) devices thinner than a human hair. This was the first application of the devices in optogenetics, an area of neuroscience that uses light to stimulate targeted pathways in the brain. The scientists implanted them into the brains of mice that had been genetically engineered so that some of their brain cells could be activated and controlled with light. Although a number of important pathways in the brain can be studied with optogenetics, many neuroscientists have struggled with the engineering challenge of delivering light to precise locations deep in the brain. Most methods have tethered animals to lasers with fiber optic cables, limiting their movement and altering natural behaviors. But with the new devices, the mice freely moved about and were able to explore a maze or scamper on a wheel. The electronic LEDs are housed in a tiny fiber implanted deep in the brain. That’s important to the device’s ability to activate the proper neurons, according to John A. Rogers, PhD, professor of materials science and engineering at the University of Illinois. Using light from the cellular-scale LEDs to stimulate dopamine-producing cells in the brain, the investigators taught the mice to poke their noses through a specific hole in a maze. Each time a mouse would poke its nose through the hole, that would trigger the system to wirelessly activate the LEDs in the implanted device, which then would emit light, causing neurons to release dopamine, a chemical related to the brain’s natural reward system. The researchers believe the LED implants may be useful in other types of neuroscience studies or may even be applied to different organs. Related devices already are being used to stimulate peripheral nerves for pain management. Other devices with LEDs of multiple colors may be able to activate and control several neural circuits at once. In addition to the tiny LEDs, the devices also carry miniaturized sensors for detecting temperature and electrical activity within the brain. Bruchas and his colleagues already have begun other studies of mice, using the LED devices to manipulate neural circuits that are involved in social behaviors. This could help scientists better understand what goes on in the brain in disorders such as depression and anxiety. 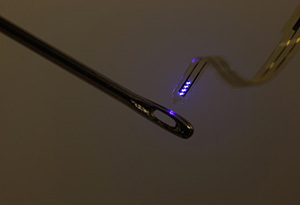 The wireless, microLED implant devices represent the combined efforts of Bruchas and Rogers. 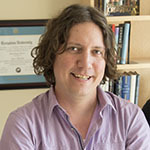 Last year, along with Robert W. Gereau IV, PhD, professor of anesthesiology, they were awarded an NIH Director’s Transformative Research Project award to develop and conduct studies using novel device development and optogenetics, which involves activating or inhibiting brain cells with light. Funding for this research comes from the National Institute of Neurological Disorders and Stroke (NINDS), the National Institute on Drug Abuse (NIDA) and the NIH Common Fund of the National Institutes of Health (NIH). Other funding comes from the McDonnell Center for Systems Neuroscience, a National Security Science and Engineering Faculty Fellowship of Energy, a US Department of Energy Division of Material Sciences Award, and the Materials Research Laboratory and Center for Microanalysis of Materials. NIH grant numbers are R01 NS081707, R00DA025182. Department of Energy grant numbers are DE-FG02-07ER46471 and DE-FG02-07ER46453.